I decided to go with UTW-Mazui on this, simply because I'm a little familiar with both of these groups (why? what did they do? I can't even remember). Hopefully, their subs are above the bar, because it's looking like I'll be archiving this anime. Before I get into the first episode of the series, here's a quick run-down of the OVAs. There's a full review by Envy here, so I won't be going into too much detail. I picked up the BD versions, which amalgamated the four 15min episodes into two 30min episodes. While it could have felt really disjointed, I think the original 4 episodes were made to flow together because there wasn't that much of a distortion in the flows of these episodes. The first part of ep01 of the OVA was essentially an introduction for Potte (full name: Sawatari Fuu), who had moved to Takehara with her family (consisting of younger brother and mother) after her father's death (which happened 5 years before the OVA). Photography is something that she's picked up from her father; this causes her to get into all sorts of clumsy situations, as she gets tunnel vision when she sees a good photo op. 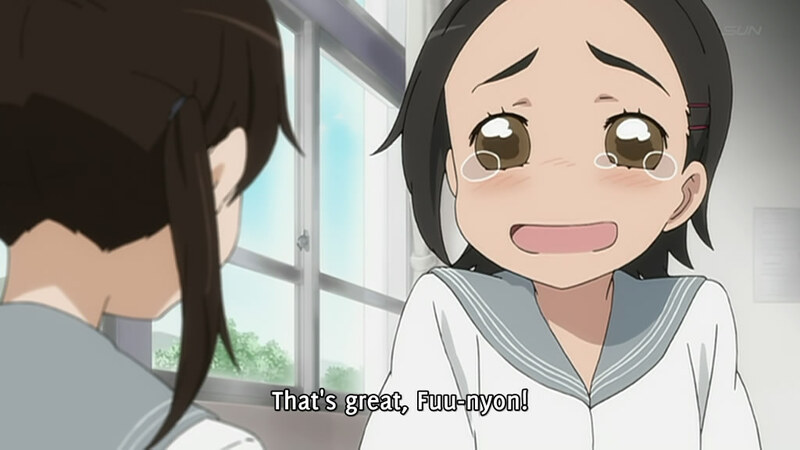 This portion introduced her friend, Hanawa Kaoru, and then showed the meeting between Potte and the other two girls that would round out the group, Sakurada Maon (who whistles frequently instead of using words) and Okazaki Norie (who translates Maon's words and also seems to adore Potte's younger brother to some serious levels). Wow, women turn into little girls when excited. 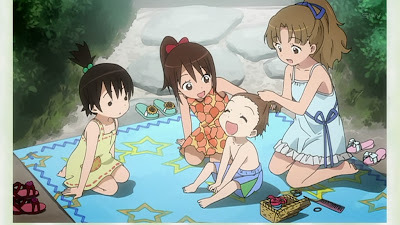 The second part of the episode was either set after some time, or girls generally become fast friends. The conversation was about what their career choices were, as the girls were high school students, and it was very nice to see that all four had different passions in life. I've always been a little sad to see characters making friends within their own circles of interest; while that's sometimes the case in real life since some people are hesitant and shy to branch out, it's always a lot more interesting to see the eclectic mixtures that frequently occur. Anyway, it turned out here that Potte hadn't realized that photography could be a career for her, as she had always just seen it as an interest due to her father. After meeting with a role model, the professional photographer Shihomi Riho, she began to rethink that idea. I'm not that into oranges, but even then I want to try that dessert. The next part had to do with Riho, the photographer, coming to pay Potte a visit. I get the feeling that she's a very nurturing person, which is really nice to see. She described to Potte what it was like to take photos, and also gave her the motivation to work passed what Potte thought were bad photo-taking skills. I like that Potte didn't have to wallow in despair before finding the drive to keep working; you don't always have to hit a low before you can get better. This part also featured Sayomi having another place that she thought was the correct location, which involved riding in a car with her deathly driving skills and then a 20min walk. When Potte sprained her foot (so clumsy...), she ended up figuring out that the scenery was most likely what Kou had drawn a picture of. The search for the location of the photo, however, continued. 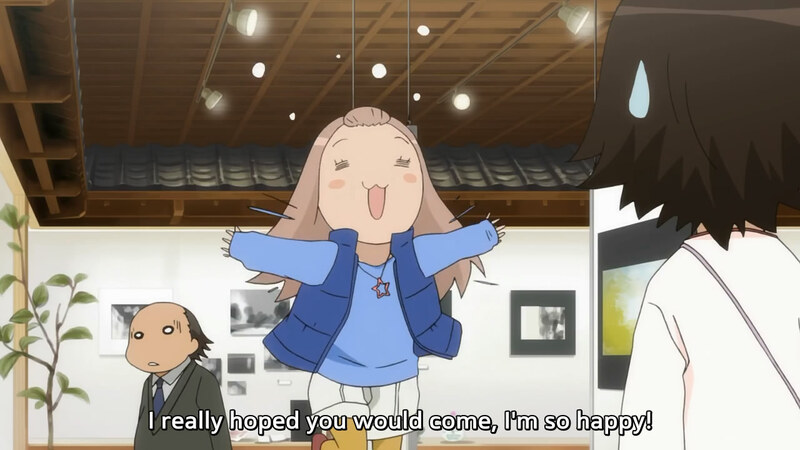 I'm glad they didn't make Norie's adoration of Kou feel creepy. 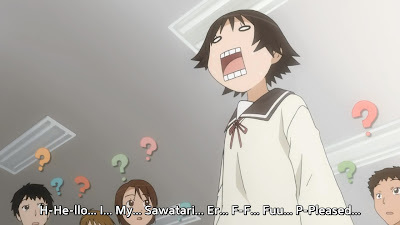 It's hard to make it clear when I've said so little, but I actually did like the OVAs. 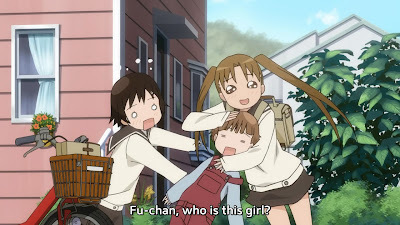 The description of this anime from the Fall 2011 Preview post made it feel as though this would be ridiculously slow and slice-of-life. However, the pacing was definitely well done; while telling the bigger story did take some time, there were plenty of little things going on to keep me amused. The character dynamic was smooth, and the diversity (strange given that it's taking place in a small town) made me very happy. 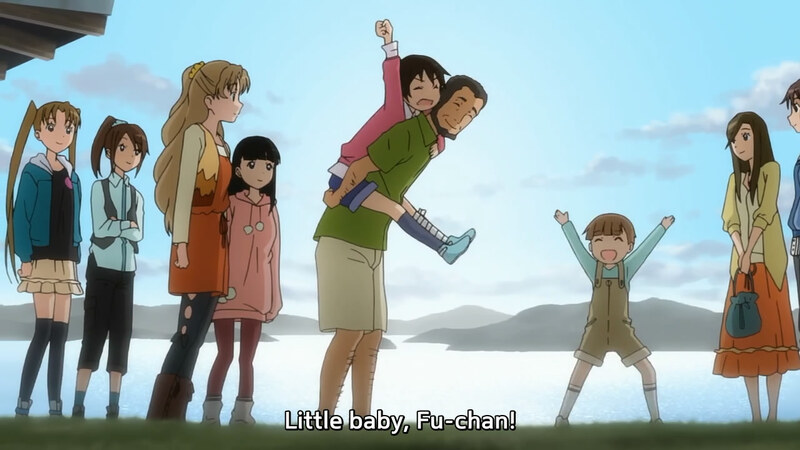 At this point, going into the first episode, I was looking forward to it quite a lot. 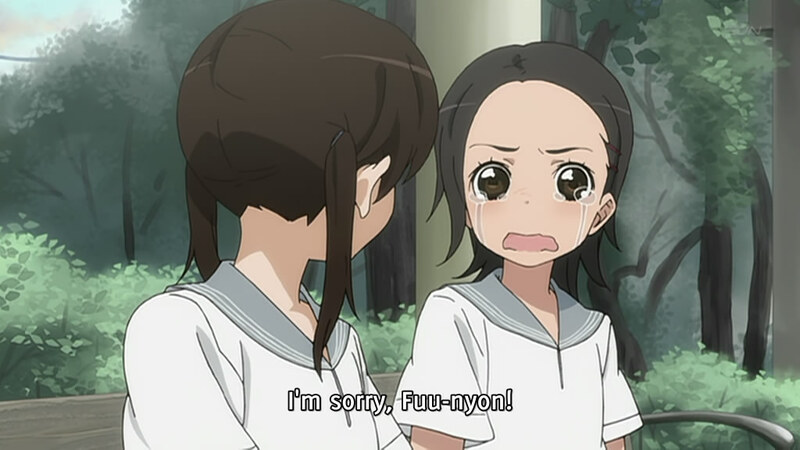 For much of the episode, Chihiro was crying. It was endearing, for some reason. 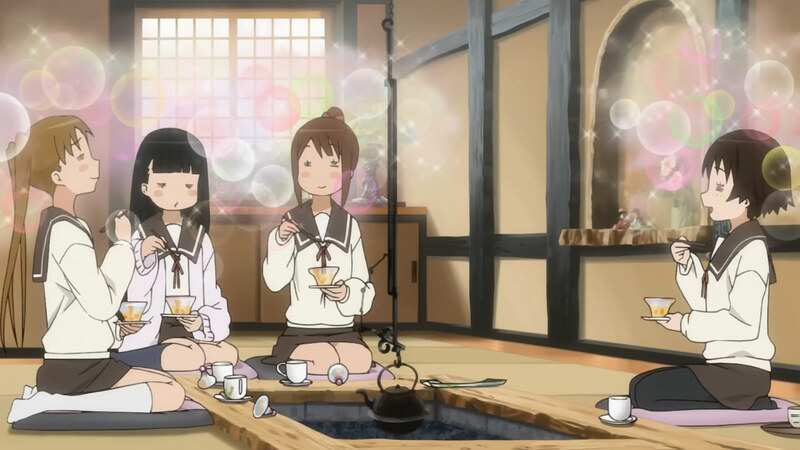 Chihiro turned out to be quite the good friend, going to great lengths in order to keep Potte from feeling sad. It was strange since she cried at the drop of a hat. She was a big player this entire episode, and I have to say that I liked her almost from the first glance. She didn't let tears cripple her; rather, she kept reaching for her goal despite crying. That was just very interesting. 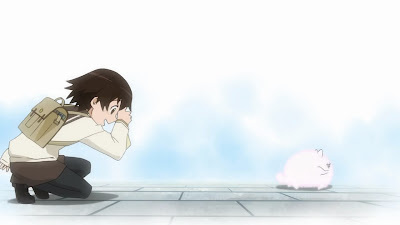 Potte credited her as the reason why she didn't cry and feel so sad about her father's passing; Chihiro tried really hard to fill her life with warmth and it was noticeable. As a side note: just as I liked how diverse the characters were in the OVA, Chihiro added her own flavour as well. 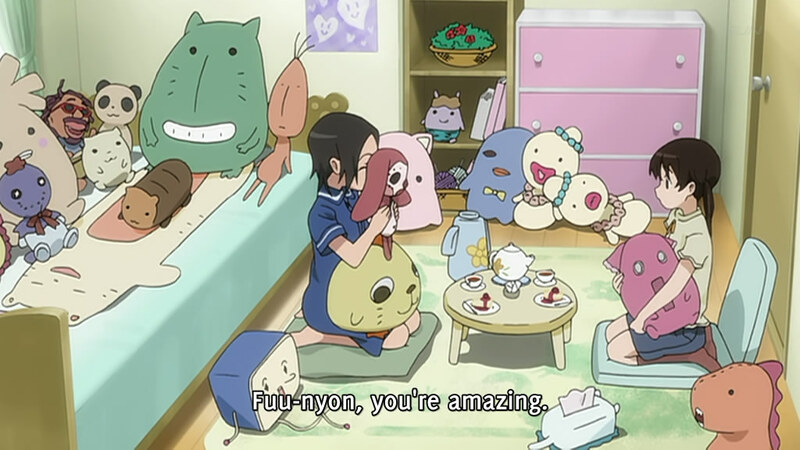 She was into crafts, making some pretty interesting stuffed animals of original characters. 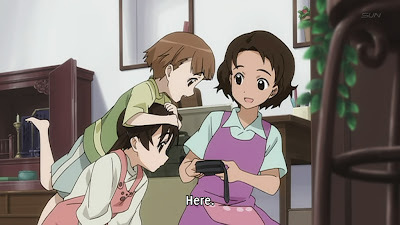 It was actually she who provided the cat-like carrying case for the camera and ticket that was seen all throughout the OVA. How old is Kou, anyway? I feel like he's pretty big in size - or the others are small in comparison. It's clear that the anime at least acknowledges the existence of the OVAs, as the day that Potte came home and found Kou looking through some old photo albums was shown shot-for-shot here. (Either that, or both adaptations took it straight out of the manga, which feels kind of lonely. I'll just assume the anime acknowledges the OVA.) Either way, this was the turning point in Potte's life that she had talked about in the OVAs; she looked through the photo album without feeling sad and even asked her mother where her father's camera was so that she could get back into photography. Why won't she be appearing more?! Once the ball began rolling, the story of this episode really picked up. Of course, it was still presented in a very slow pace, which made it rather interesting. The scenes felt calm and nurturing even though so much was really happening. While the intention had been for Potte to head over to Takehara by herself and live with her grandmother, Kou suddenly announced that he wanted to go wherever his older sister went. With that, Potte's mother immediately announced that they would be moving, as if it wasn't a hassle at all to quit her job. Seeing that kind of tight family makes me a little jealous; if only Pearz was less tsundere, we could all be happy too. But I digress. Wow. I need to visit Envy more often. Do girls' rooms really look like this? Potte told Chihiro of her plans, which was a really bittersweet scene (especially so considering I'm well aware that Chihiro will not be a main character in this series). 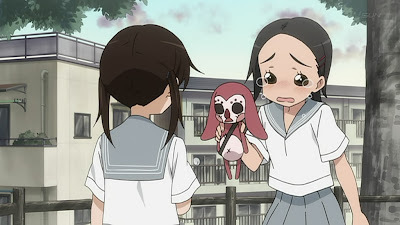 Despite being obviously sad that her friend was leaving, Chihiro was still happy that Potte seemed to be coming out of her shell. Interspersed with this was Potte writing a letter to her admired photographer, Riho, and sending some photos along. Just as she had recalled in the OVAs, the response came and it was extremely touching. The ticket without a destination was shown, which would be further explained in one of the OVAs as a keepsake to remember that the world was your oyster (essentially). As I was watching this episode, it felt like I already knew all of this - however, far from seeming mundane due to repetition, it made me feel like I belonged. I don't really know or understand what that thing is, but I want it. The episode ended with Potte, with a haircut, arriving in Takehara with her luggage, with her mother and brother arriving at a later time, and Kaoru arriving at the station to pick her up. As much as the girls cried, it wasn't particularly tear-inducing for me, even though the interplay of scenes was pretty sweet. I'm curious as to where ep02 will find Potte; I don't want to see a repeat of the things that happened in the OVAs since it'll undoubtedly feel slower when stretched out to a half-hour episode rather than a 15min short.